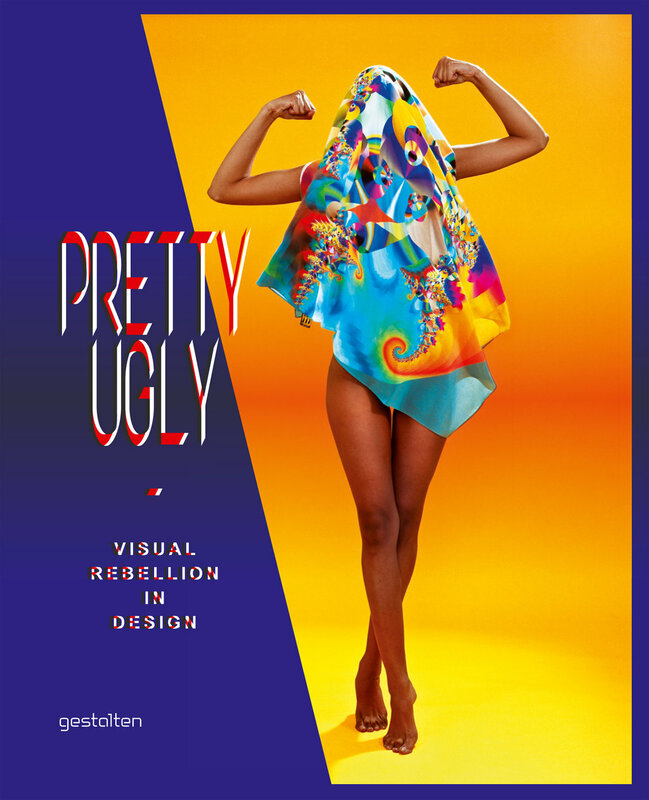 I love when the mailman delivers a book I’d forgotten I’d ordered; last week’s surprise tome was ‘Pretty Ugly: Visual Rebellion in Design’ (buy it here). An examination of the “new ugly” in design, it’s full of examples of high style that’s purposefully low-brow … think garish colors, bizarro fashions and furniture, amateurish photography, cringe-worthy typography. You should know I love it … and what a great book to receive right now; I haven’t been able to put it down. I was thinking of this book Saturday morning when Paul came home from the farmer’s market with a Japanese eggplant that had something extra: a ski nose that Bob Hope might envy. Silly, I know, but I had to memorialize this special veggie before it became ratatouille … why not have it star in a ‘Pretty Ugly’-style scene of domestic drama? I have plenty of gaudy-hued stuff around the house I can use as a backdrop and I am a fiercely amateur photog, after all. 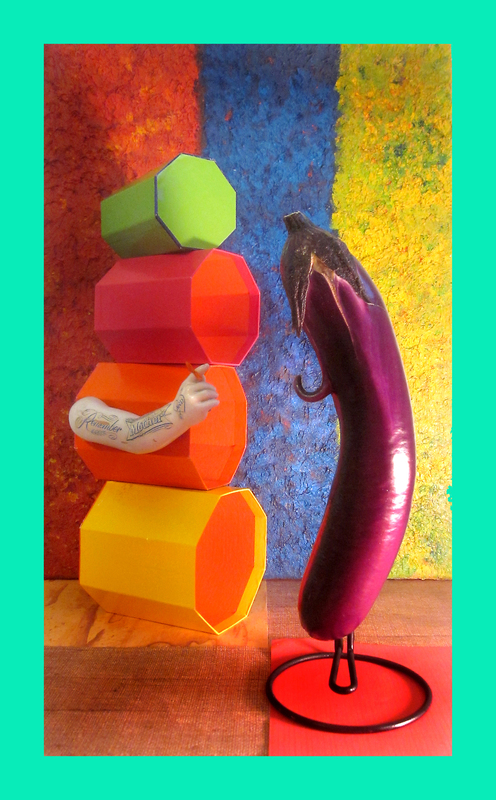 Well, I thought the photo turned out so well I targeted two additional far-mar veggies for tableaux; they follow. The wayward eggplant was our ratatouille’s delicious main man Sunday morning, but I think next time I’ll try this savory version that features capers and fresh mint. 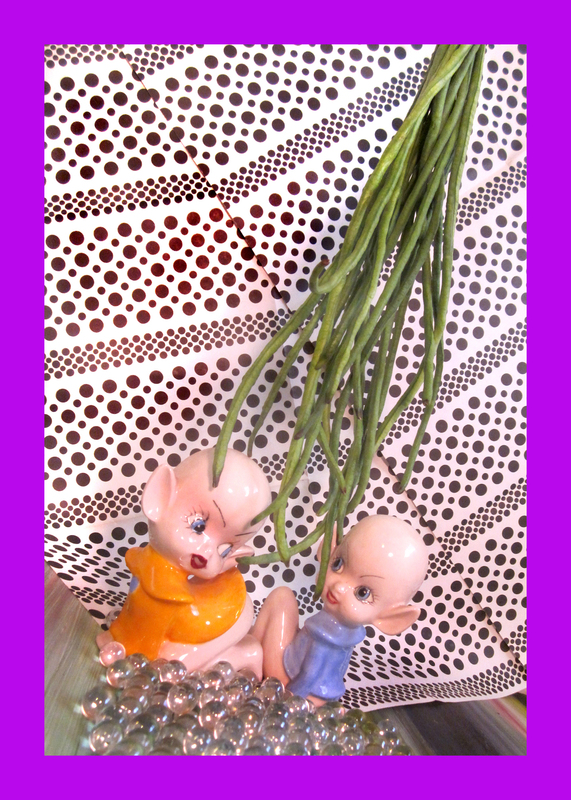 Beneath polka-dotted paper skies, Chinese long beans cascade over chola-browed alien princesses; the same beans cut down were added to Sunday’s ratatouille. Next time I think we’ll pickle them; click here for the tangy recipe. 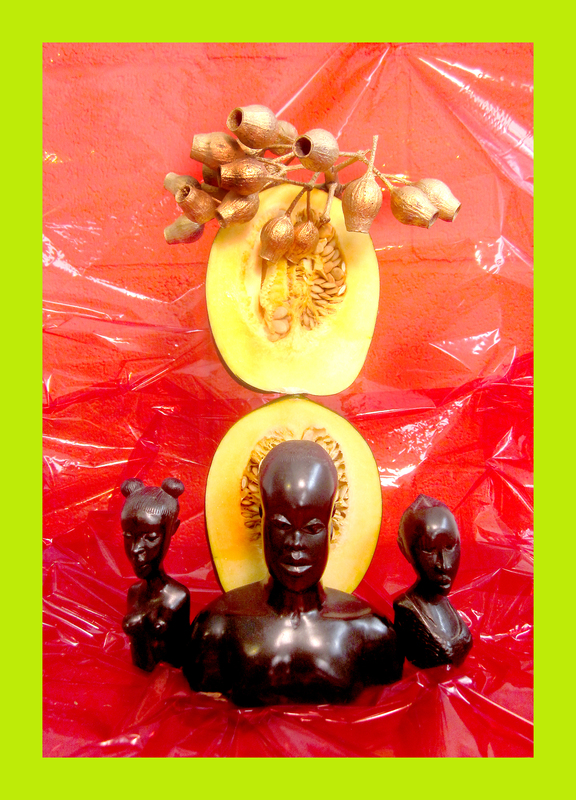 Finally, this imperial vision comes courtesy of a halved acorn squash and some collected African busts. Inspired by the pairing I tracked down a recipe for African Peanut & Squash Stew. As always, I altered the recipe to suit my tastes, doubling the spice amounts and using a large jalapeño pepper in place of a small red one. Easy and quick to prepare and delicious … Paul’s having some for breakfast with a hard-boiled egg sliced into it. I enjoyed putting this post together, it got me off the couch painlessly and kept my mind from becoming mush … Now to tackle that huge stack of art and photography books in my office, there’s inspiration between those covers! Yum, that does sound good, Guida. Lettuce tacos á la Danny are on the menu … thanks! That stew sounds delish. Can’t wait to try it one of these days. In the meantime, I’m enjoying the grilled eggplant tonight! Excellent choice … and do try the soup, it was great!